If you will indulge me, I will present you with another movie-inspired post. As always, not a proper review of a movie -- just thoughts inspired by it. I thought The Imitation Game was a wonderful film, top to bottom. A scene at the end, however, rubbed me the wrong way because it contained a typical message that I think is damaging. Alan Turing (inventor of the computer) sits, after all of the dust has cleared from his incredible intellectual victories, with his friend and colleague, Joan Clarke. They discuss how she has found, as Turing (a genius and an outsider in every conceivable way) points out, a "normal" life of marriage and career, etc. Joan chastises him for wishing to be "normal" and she points to an array of dials and wires in the next room (another prototype computer) and tells him "no one normal could have done that." I disagree. I think someone "normal" could have done that. More of that in a minute. That message really bothers me. It contributes to the perpetuation of a cliche; that geniuses cannot be "normal" people. On one end, it makes some sense. If normal means "typical" I would argue that geniuses are, by their very definition, atypical. They are not "the norm," simply by virtue of their superior intelligences. But need they be "troubled" and "disturbed" and "outsiders" and...unhappy? No, I think not. So what we don't need is the torrent of movies, books and articles pushing the idea, to young and budding geniuses, that weirdness and misery are job requirements. For years, women were told they should be either mothers or secretaries. Look what happened when that message changed. What do you think would happen if we depicted geniuses as socially-functioning people? Would it be inaccurate? Sure, to some extent. Let's face it: some geniuses were disturbed and unhappy and were isolated because of their differences from the people around them. The problem is, we hear more about them than the "normal" ones because it is Romantic. But I am sure there are even more geniuses whose lives contained pretty fulfilling family, social and spiritual elements. But who wants to watch a movie about that? Whatever the case, there is merit in telling the young geniuses out there that the struggle might well be worth it; that it is, indeed, possible to be both brilliant and part of the waking world. All sorts of research shows that association with other humans is good for our health and happiness. It need not be a sacrifice of our individuality to have -- or to learn how to have -- friends. This is not meant to be an implication about my own intellectual abilities, but, I do know the struggle of trying to be "normal." Despite being an introvert, I spend a lot of time around people. It can be difficult. I do well with an audience. (I am, after all, a teacher.) But there are times when the weight is on my heart is palpable. Even at gatherings with my own family or friends, I often find myself retreating to the bathroom just to lock the door for a minute and "recharge" with a little solitude. It is not unlike the physical feeling of needing to sit down after a lot of time on one's feet. Something inside me desperately needs a "rest" from all of the words and all of the people pressing in on me. I could give up, as I have know some to, and hide. I could always stay home (as I usually want to do) but I fight against it, knowing that my happiness and health, to some large extent, rely on others. Solitude is wonderful; isolation is the start of an ever-increasingly frosty winter it the heart. How many young people have you seen brag about "weird"? (Go on YouTube and find a million of them.) They, in their awkwardness, are playing a role; embracing their abnormality. Why do they do this? Because of cultural models, whether among their friends or in books and movies and television shows. There are obese people out there embracing their largeness, these days, and working to crush standards of beauty. It might be liberating for them, but, it sure isn't good for their health. One can't deny that those who innovate, create, problem solve and change the world tend to be different than those around them. It is a blessing and a curse. But, if geniuses were led to believe that they can be both exceptional and "normal," we might find ourselves surrounded by many more content world-changers. Enough of this "no one normal could have done that." If normal means to be like everyone else, I'm out. If normal means to be just enough part of the world that I feel at home in it, I'm in. Geniuses have a right to the same normality, free from the pressures of what the world expects, just as women deserved to be liberated from the kitchens, bedrooms and typewriters of cultural expectation. Any woman has a right to choose to be a stay-at-home mom or to be a corporate executive, now. Geniuses should have a right to choose to join the world around them without fear they will be seen as typical; without using cultural cliches as an excuse to give up on being part the human tides. I experience the problem in reverse, when many well-intentioned people suggest that my Asperger's son must be gifted and recommend a viewing of The Imitation Game to inspire him. Not all genuises are odd and not all odd people are genuises. My son is bright, but I've yet to see any signs of exceptional ability and I don't think it helps him to have the burden of other people's unrealistic expectations foisted upon him. So I agree, let's get away from the cliches. I know from my experience in education that Asperger's and high intelligence are frequently connected, but certainly not always and definitely not always on the genius-level. Damage can indeed be done by making a young man think he should be at a certian level, as you say. I suppose there would be no harm in a viewing of it, without comment about it, just to see what happens. A lot depends on the viewer's (or your son's) perspective on himself; whether he is even conscious of being different. In that case, the question is whether the film would be liberating or exascerbating to already heightened anxieties. Sadly, nothing's ever simple; especially not for a parent. 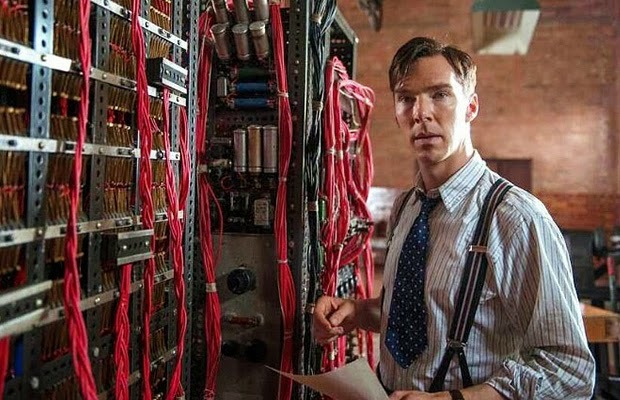 Knowing something about Enigma, Bletchley, and Turing, I did not think it at all a good movie. I think that Harvey Weinstein rivals Oprah Winfrey as dowser for the deposits of pudding in the American soul--a resource worth millions and Oscars to those who can find it. I will refer you to http://www.theregister.co.uk/2015/01/26/verity_stob_turing_movie_script_as_it_should_have_been/ for a clever summary of the movie's problems. Geniuses come in all sorts. Such men as von Neuman, Ulam, and Feynman certainly qualified for the term but seem to have been outgoing and sociable. George -- Thanks for that list. I was considering coming up with one, but got lazy, but it certainly does underscore my point. I knew very little about any of it, admittedly. In fact, it popped back into my mind that the computer came out of all of it just as I realized what Turing was asking for money for. (I thinkn I let out an audible "Ooooohhh" in the theater when it occured. So, my ignorance probably served my favorable review. I will be going on to read more about all of it. Good to hear from you as always. Simon Singh's The Code Book covers Enigma well. As for geniuses, think of Richard Wagner. Undoubtedly a genius, undoubtedly a miserable human being. Does one become a musical genius by being a miserable human being? Nothing that I know of musical history suggests that the greats were biased towards the rotten side of the range. Thanks for the recommendation -- I will get a copy as soon as I can. It's a fascinating historical story. It would be interesting if someone (preferably someone other than I) gathered statistics about geniuses and mental health. Of course, both the terms "genius" and "mentally healthy" are subjective, I suppose.